SRINAGAR , Dec 23 2012 (IPS) - Seventeen-year-old Afzal is an unusual orphan. Though his father died many years ago, his mother is still alive and living with Afzal’s grandparents and younger siblings in a house not far from the orphanage where the boy has spent most of his teenage years. Once a month, on the day when his mother and younger brother come to pay him a visit in the Bait Ul Hilal orphange in Kashmir’s capital Srinagar, Afzal has, briefly, a reason to rejoice; but his excitement is short-lived. As soon as visiting hours are over, he is left on his own again, wishing he could return home with his family. Like thousands of other children in Kashmir, Afzal has been orphaned not by the death of his parents but by crushing poverty. “We are poor. My mother cannot afford my schooling and my upbringing,” he told IPS simply. This is Afzal’s fourth year at the orphanage in his hometown of Kupwara, which is home to thousands of children. Farzana told IPS she no income, and runs her family using the money she receives from a local NGO. Other children living in Bait ul Hilal have a similar story. Not a day goes by when frail, dark-complexioned Nabeel does not wish he were back in his own house, with his mother and three siblings. “My father was a militant and was killed five years ago. I have lived here ever since, as my family plunged into poverty,” Nabeel told IPS. Nabeel’s mother says the only reason she sent her son away from home was so he would have a chance to get a proper education. “I cannot pay for his school, books and other expenses. I earn only 55 dollars per month working as a domestic helper,” Arifa, Nabeel’s mother, told IPS. In 1986, before the armed uprising cast its shadow over the Valley, Srinagar had a single orphanage. For the most part, kindly neighbours or relatives adopted orphaned children. But the number of orphans has risen sharply after the insurgency claimed the lives of about 100,000 Kashmiris, mostly young men, many of them fathers. The UK-based NGO Save the Children recently put the number of orphans in Kashmir at 214,000 , 37 percent of whom have been ‘orphaned’ – either directly, due to their parents’ death, or indirectly, through poverty – by the conflict. 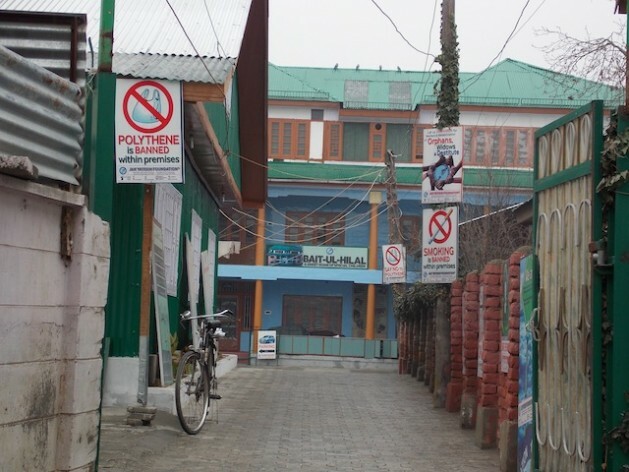 The orphanages spread across the Kashmir Valley are full of children who still have one parent – mostly mothers – but have been driven by destitution into state-funded homes. Zahoor Ahamd Tak, chairman of the Jammu and Kashmir Yateem Trust, a large local orphanage in the Valley, said that most children living in orphanages around Kashmir have mother and grandparents. “But after losing their breadwinner, the family faces immense poverty to the extent that they are unable to bring up their children,” Tak told IPS. If the government provided some financial support to such families, Tak added, they would not resort to sending their children away from home in a bid to keep them fed, educated and cared for. But while families insist they have their children’s best interests at heart, experts point out that food, clothing and education do not come close to satisfying emotional and psychological sensitivities. Ripped from their homes and placed in centres that do not have the resources to attend to more than the residents’ most basic needs, these ‘orphans’ are now developing mental disorders at an alarming rate, experts say. A recent survey conducted in orphanages around the Valley by Dr. Mushtaq Margoob, a renowned psychologist, found that nearly 41 percent of the residents suffered from post-traumatic stress disorder (PTSD), while a quarter of the children living in these homes showed signs of major depressive disorder. The study also found a 7-13 percent incidence of seizures, attention deficiency hyperactivity disorder (ADHD) and panic and conversion disorders. While some homes have been able to address the emotional needs of the children, and create a ‘home away from home’, most orphanages end up provoking or exacerbating psychiatric disorders. The specialist psychiatrist agrees that orphanages, which tend to neglect “intellectual and emotional needs”, are breeding grounds for mental health problems. He strongly believes orphanages should provide a social environment that offers close and stable relationships between members. Bashir Ahmad Dabla, a sociologist at the University of Kashmir, added his own concerns about the developmental impacts of this “unhealthy” trend. “These children may have lost their fathers but sending them to orphanages (strips them of) the love they could receive from mothers, siblings and other family members,” Dabla told IPS. The moment a child is admitted into an orphanage – and made to live on the sympathy of strangers, even though they have a family of their own – it changes their outlook on life and society, since they are viewed as outcasts and sometimes even a burden on society. According to Zahoor Tak, 80 percent of orphans are unable to continue their education after the 10th grade,which is when they are sent back to their homes.